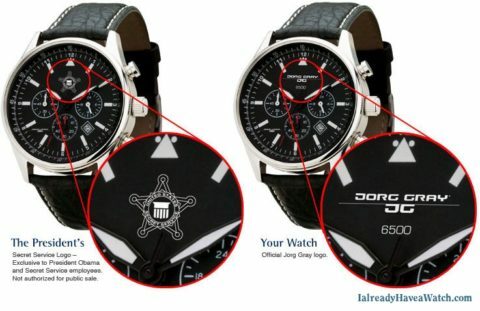 President Barack Obama’s Jorg Gray Secret Service Watch – I Already Have a Watch. Of course, Jeff had a published an account already earlier this spring (International Watch Magazine, April 2009) on his quest to identify Obama’s watch, but it seems that awareness has now been seeping into the mainstream and these otherwise unremarkable chronos are quickly becoming a minor worldwide cultural phenomenon and attracting the attention of major media outlets. In contrast with the high-end watche chosen by many world leaders, the last several US Presidents including George W. Bush and Bill Clinton favored simple Timex watches while in office, perhaps for their implied association with the “working man” or for Timex’s perceived image as an “American” brand. Obama had been known previously to wear a Tag Heuer 1500 purchased following his graduation from Harvard Law School. However, on the occasion of his birthday in April 2008, Obama was presented with a Jorg Gray chronograph by his Secret Service protection detail which seems to have seldom left his wrist since. It should be noted as well that while many sellers still offer the regular quartz Citizen-based Jorg Gray chronograph, the Secret Service marked model is not available to the public. It remains available exclusively though the Secret Service’s employee store and purchasers will instead receive a watch that is of the same model but not marked with the Secret Service emblem. Jorg Gray Secret Service and "civilian" model chronographs. I had the opportunity last year to examine one of the actual Secret Service edition watches in person last year. Overall build quality and fit and finish seemed very good considering the price point and I was impressed. My few criticisms might be that despite their lovely sword shape the hands don’t seem to have been properly sized for the dial and the minute hand doesn’t quite reach the index marks. As well, putting an off-the-shelf quartz chrono movement into a larger case results in the “tricompax” subdial layout that feels unnecessarily crowded into the the center of the dial. But if you’re looking for a reasonably built watch with a little bit of indirect Presidential cachet, it’s quite nice. Hat tip to OnTheDash.com reader Shaun for pointing out the Times article. Tagged with jorg gray, obama, timex. Personally, I am a Tag Heuer guy, but I have to admit that this watch is beyond cool. As you suggest, it definitely has a bit of the Presidential panache attached to it!